Rotork CK range modular electric valve actuators have provided a reliable and economical automated flow control solution for a hydroelectric generating station in Mexico. The actuators have been installed at the Alameda Hidroeléctrica Planta to control the flow of water to turbines generating up to 6 MW of electricity. The modular CK design enabled the operator to tailor the actuator specification to precisely match the requirements of the application. The selection of CK actuators complete with Centronik digital control units required only the provision of a mains electricity supply to provide automation of the previously hand operated valves. The Centronik control unit provides intelligent valve control with data logging for diagnostics and asset management. Rapid and secure commissioning and configuration is performed using selector switches on the Centronik housing or via a setting tool, following user-friendly menu driven screens displayed on the actuator indication window. In normal operation the window displays the valve position, valve status and alarms. Standard features that are common to all CK actuators include IP68 double-sealed environmental protection, plug and socket connections for fast and efficient commissioning and maintenance, motor-independent handwheel operation, mechanical valve position indication and independent torque and position sensing for increased valve protection. 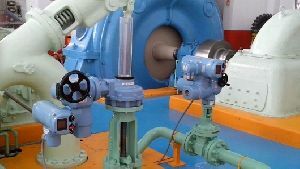 Actuator gearboxes are oil lubricated for extended life and separable thrust or non-thrust bases enable actuators to be removed without disturbing the valve position. CK actuators are fully supported by the Rotork worldwide network of offices and representatives, in this case locally provided by Rotork Servo Controles de Mexico.